An evicted mother single mother standing on a snow-covered sidewalk in front of a refrigerator, microwave, mattress, chairs and boxes. With her life stacked out on the street, Shantana Smith of Milwaukee stood with her hand covering her mouth after she was put out of her home. Such a scene of poor, black mothers being evicted is a familiar one, according to a recent New York Times story. In Milwaukee black women are 14 percent of the Midwestern city's population and 40 percent of those evicted there, according to the NYT story. "Just as incarceration has become typical in the lives of poor black men, eviction has become typical in the lives of poor black women," sociologist and researcher Matthew Desmond told the NYT. 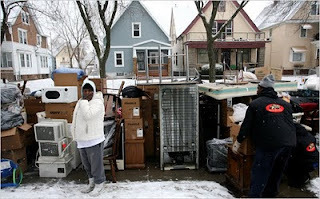 Eviction as a rite of passage for poor black women is a cycle I'm not ready for us to accept. But it looks like the trend is well underway and rough economic factors may cause things to become worse. With black women having a more than 13 percent unemployment rate, higher than the national average of almost 10 percent, and unemployment checks set to stop for many this week, more evictions of poor black women will be no surprise. Low-income jobs and lack of responsibility were a couple of reasons the NYT story cited for the high eviction rate among black women. While I believe poor decisions may have led some black mothers into homelessness, poor polices and urban planning play a role too and have caused families to suffer. A displaced family is a disconnected family. No one knows that better than New Orleans native Triege Kerry Cotton. She was forced to leave her home five years ago when Hurricane Katrina battered the Gulf Coast. Cotton finally moved back into her New Orleans home earlier this month at the Harmony Oaks development. Cotton grew up on the same space when it was called the C.J. Peete Public Housing Complex. Developers are working to make it a different place. A new school is part of the development. The new development also aims to attract middle-income residents to the homes. "I am thrilled to be home again," said Triege Kerry Cotton. "But it's not just about moving back, it's about moving up." A sound urban plan can help other poor women of all ethnic groups move up too and not continue a cycle of moving out into homelessness and hopelessness. A safe place to live and a good school are among the basics any mother wants for her children. A solid job will help with that too. Congress is working on a jobs bill. When they get that accomplished perhaps federal lawmakers can revisit the urban agenda and strategies that will stabilize neighborhoods.